I haven’t had yogurt in over 20 years, due to a dairy allergy. This is how I turned that around. I was given a yogurt maker when my Mother moved out of her apartment. She said it was easy and I should try making my own yogurt. Well, I’ve been allergic to dairy all my life. I thought she might have forgotten that about me. Of course it sat in a bag in my room for about a year, forgotten. I saw it when I was cleaning for the Christmas season. Here is the result of my recovering the yogurt maker. It’s easier then it looks. Keep reading. Warm the oven and sterilize the jars: Warm the oven for about 5 minutes, until it reaches about 100°F, then turn off the heat — leave the light on to help keep the oven warm. Fill the jar(s) you’ll use for storing the yogurt with boiling water to sterilize them. Let stand a few minutes and then pour the water out. Alternatively, you can run the jars through the dishwasher. Note: If you have a yogurt maker, this would take the place of heating the oven talked about above. The sterilizing would be the same as above. Pour the cashew milk into a saucepan: After blending the cashews and the water in a high-speed blender, open it; pour it into a medium pot. Add the thickener: If you’re using agar agar, sprinkle 1 teaspoon of agar agar flakes into the pot over the cashew milk — but don’t stir! If you’re using tapioca starch, scoop out roughly 1/3 cup of the cashew milk and transfer to a bowl with the starch. Whisk this together until the starch is dissolved, then pour back into the pot. Warm the cashew milk: Place the pan on the stove over low then medium heat and warm until the coconut milk just starts to simmer. (The agar agar will also start to melt together.) Whisk the milk and turn down the heat to low. Continue cooking on low, whisking occasionally, for 5 minutes, until the agar agar flakes are fully dissolved or the tapioca starch has thickened the mixture. Cool the milk: Cool the milk until it’s just warm to the touch, about 100°F. Add the probiotics: Twist open the probiotic capsule and pour the powdery contents over the milk (discard the capsule’s casing). Whisk to combine. Alternatively, whisk in 4 tablespoons store-bought vegan yogurt starter. Add the organic sugar or maple syrup or vanilla. Whisk together well. Pour into jar(s) and allow the yogurt to set for 12 to 24 hours: Pour the cashew milk into the sterilized jar(s) and screw on the lid(s). Place into the oven — turn the oven light on, to keep the environment warm. Alternatively, use a yogurt maker or place into a dehydrator at 110°F. Leave for 12 to 24 hours without disturbing. Keep yogurt refrigerated and use within 2 weeks. *Soaking cashews or any nuts, means letting the nuts soak in water for 4 hours. If the yogurt develops a pink or grey discoloration on its surface, it has been contaminated with bad bacteria. Throw it away and do not eat it! This recipe will work with any nut milk or coconut cream too, so get creative and change it up. Only use home made alternative milks, as the store bought types are full of fillers and chemicals. They are not a healthy option. 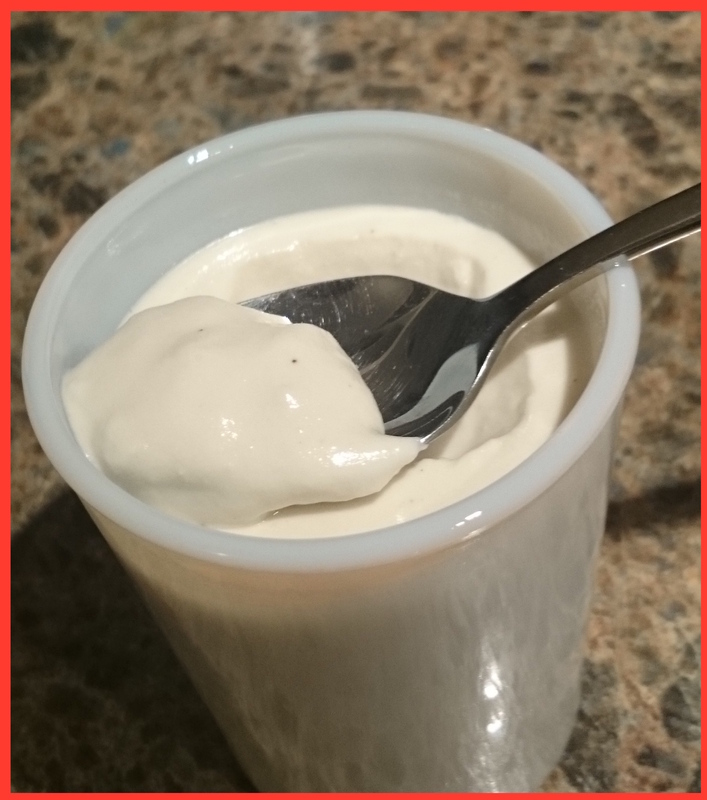 Scoop about 1 tablespoon of the fermented yogurt into a small bowl and stir together with 1 teaspoon ground psyllium husk. Pour back into the jar and stir together well. Stir 3 tablespoons of chia seeds into the jar of fermented yogurt. Chill for 4 hours until thickened. Add berries, sweetener of choice and nuts and enjoy. Transfer the yogurt to a strainer lined with cheesecloth and set over a bowl. Allow to strain overnight. You can use the water left over in your next smoothie drink.